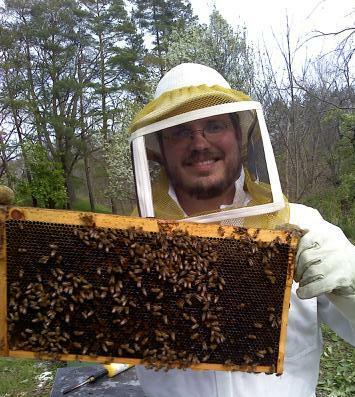 No, really, I’m a beekeeper. 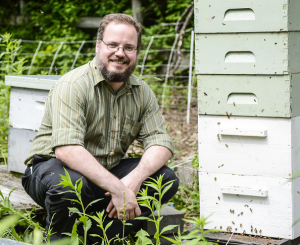 As a beekeeper with approximately thirty colonies at any one time, and as president emeritus of the Ontario-Finger Lakes Beekeepers Association, I’ve been almost overwhelmed by the Flow Hive™. Specifically, I’ve been tagged, e-mailed, shared with, tweeted at, shared with, tagged, tweeted at, shared with, tagged, shared with, and tweeted at to the point where I should feel grateful that so many people value my opinion on this topic, but all it really makes me want to do at this point is slap people just to make it stop. So here’s my opinion on the Flow Hive™, even presuming it works exactly as advertised, doesn’t create additional places for parasites (such as varroa mites) and pests (such as small hive beetles) and molds to hide and thrive, doesn’t cause robbing frenzies when you use it, and never, ever breaks. Many have objected that the Flow Hive™ separates the beekeeper from the bees he’s keeping, in a spiritual or psychological way. I don’t much care about this very common objection, and I think that keeping bees to make money is an entirely fine thing to do if done responsibly, so I don’t plan to address this issue here. Similarly, many have raised the issue as to whether or not rupturing thousands of cells at once—in a place that traditional beekeeping has not ruptured them—is truly as unobtrusive and harmless as claimed. I doubt we know either way at this point what the long-term ramifications of that are, but addressing this concern goes against the “it works exactly as advertised” benefit-of-the-doubt I prefaced this with, and there are bigger fish to fry. So let’s put that aside as well. Many have also expressed concerns with the fact that it’s made of plastic, and plastic isn’t natural. This doesn’t bother me much. I use wax-coated plastic frames in my own hives, and responsibly replace them every three to four years. However, these frames cost me a little over a buck. Flow Hive™ frames are so expensive I laughed out loud when I clicked on their IndieGoGo campaign minutes after it launched. $230 for three frames, which won’t even fill a super, plus the tube and key you need to make it work…and not a single mention that in order to avoid pesticide buildup you need to replace your comb every three to four years—even though bees having to rebuild wax on that foundation costs a lot in both time and honey production–the old adage is that it takes eight pounds of honey to make one pound of wax, and bees can’t fill nonexistent wax with honey. Beeswax starts off white. When it looks like this, it’s time to get rid of it. Or maybe a year past time. You see, beeswax is astoundingly good at absorbing foreign chemicals, most importantly pesticides. It does this job so well that some have hypothesized that in the colony superorganism, the honeycomb serves to some degree as the liver and kidneys. But unfortunately, it doesn’t do as good as job as you’d like at isolating bees from the effects of those chemicals once it’s absorbed too much, and researchers have identified old wax as a significant source of contamination in modern hives. Because of this, all conscientious beekeepers replace their frames (whether plastic or wax foundation) on a regular basis. It’s costly and burdensome to replace frames of drawn-out wax (that the bees are still willing to use) at a buck or so a piece, to the point that many beekeepers “stretch” old frames a year or two or three longer than they should. I shudder to think about the impact that a price of seventy-ish dollars a frame will have on your average beekeeper’s decision to replace their Flow Hive™ frames on a responsible schedule. The makers of the Flow Hive™ contend that this method harvesting honey is less stressful for the bees, because you’re not digging into the colony to get at the frames of delicious, lucrative honey. This claim is downright absurd, not because it’s wrong, but because it’s almost completely irrelevant to the practice of responsible beekeeping. Oh, but it’s also wrong, for two reasons. Let’s take those claims one at a time. Western New York is almost unique in that there are two separate nectar flows, separated by a several-week dearth known as “early-to-mid August.” The vast majority of places have one continuous flow, which means that you harvest honey once a year. There are more and less intrusive ways to extract honey—from escape boards (which really aren’t stressful at all, but are more labor intensive) to strong essential oils that drive the bees down and out of the honey supers, to pulling the frames individually and knocking or brushing the bees off (which I wouldn’t recommend for a variety of reasons, despite the fact that they did it in The Secret Life of Bees). And you do it once, maybe twice a year. My next point requires a little education on how bees make honey. The nectar foragers bring nectar, which is mostly water, back to the hive in their honey stomachs. They regurgitate it into cells of honeycomb, where other bees fan it to evaporate out the water. Once the moisture content is so low that contact with the honey will kill bacteria, the honey is “ripe” and won’t spoil as long as it’s kept in an air-tight container—which is why at this point the bees “cap” the honey with wax. When you extract honey, it’s important to pull only “ripe” honey, with a rule-of-thumb being 90% of your frames need to be at least 90% capped before you pull them for extraction. But when bees store honey, they start at the outsides of the frames and work their way in. Because of that, there’s no way to tell by looking through the window in a Flow Hive™ whether or not the honey you’re about to take is ripe (and thus won’t spoil in the jar); to do that, you have to open the hive and pull the frames so you can inspect them. Huge commercial operations have reverse osmosis machines or evaporators that enable them to “ripen” honey once it’s pulled, to the tune of tens or hundreds of thousands of dollars. Your average Flow Hive™ user simply doesn’t. …so if you don’t want to extract unripe honey, you have to disturb the hive anyway, in exactly the manner that the Flow Hive™ folks claim you don’t. Responsible beekeepers always ensure that they’re taking only excess honey from their bees. Doing so can benefit the hive—prevention of late-season swarming, for example. When they pull honey supers, they make sure that they’re leaving behind enough for the bees to make it through whatever time of year it happens to be, especially as one approaches fall and winter. They need enough honey to get through this. To this end, the beekeeper will often pull full frames of honey out of the supers and put them in the brood nest, or sometimes even leave an extra super of honey on top for the season ahead. This determination requires that you have to, you guessed it, disturb the hive in exactly the manner that the Flow Hive™ folks claim you don’t. Honey processing is hard on the beekeeper’s back, it’s time consuming, it’s messy, and it requires some rather expensive equipment such as centrifugal extractors if you don’t want to make it even more of the former three. But unless you’re an idiot the one thing it isn’t is particularly hard on the bees. The much more common instance where you have to disturb your bees (and despite your best efforts you’re going to squish some, and break apart things they’ve propolized (glued) together, and probably muck up the pheromone cloud with some smoke from your smoker) is when you pull frames from the brood nest. And the OFLBA recommends that seasoned beekeepers do this once a month during the spring, summer, and fall months, for reasons that have nothing whatsoever to do with the honey harvest—and we figure your average newbie will do so about twice a month just to educate themselves on what’s going on in the hive. Removable frames are a relatively new invention (circa 1850), but they’ve been required almost everywhere in North America (and elsewhere) for much of that time, for one specific reason: removable frames enable the beekeeper, or a government-appointed inspector, to inspect a colony for disease and parasites. It also allows the beekeeper to make sure that the colony is queenright (has a healthy, laying queen) and that everything is generally as it should be—and to do something about it if it’s not. Like any form of livestock management, most of your effort and energy goes into trying to keep your little darlings alive. The Flow Hive™ does absolutely nothing that would decrease how often you inspect your bees. On their IndieGoGo website they mentioned several times that you have to inspect your colonies twice a year. What a raging catastrophe that level of neglect would be for bees everywhere, and it’s good that in the face of criticism they now mention well down the page that you still have to maintain your brood nest just like any other beekeeper. There are a depressing number of things that can and will kill colonies of bees. Many of these things are contagious from one colony to another—using drones (males) and honey robbing from weakened hives as vectors to spread, and many of them will spread enthusiastically unless the beekeeper acts with (relative) alacrity to either curb the problem or remove the problematic hive. Now, as Australians, the Flow Hive™ inventors don’t have to contend with American Foulbrood—which is an anthrax-for-bees-like disease so bad that in most states (including New York) a colony must be burned in its entirety and the ashes buried to keep it from spreading. But they have varroa destructor mites, and nosema apis and nosema ceranae, and tracheal mites, and… you get the idea. A beekeeper spends 90% or more of their time on pest and queen management, and perhaps 10% on honey. Selling the Flow Hive™ on the notion that it makes beekeeping in general easier is, at best, hopelessly naive, and at worst cynically dishonest—and while I applaud them for changing their tune on hive inspection, it still means that they’re selling a tremendously expensive product that might make a small fraction of the work of keeping bees easier. 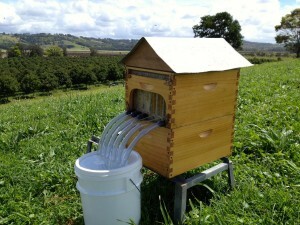 I geek beekeeping, which is why I think the Flow Hive™ is going to cause well more harm than good for bees. In conclusion, I’d have to say that this gimmick at best solves a problem that doesn’t need solving, overstates its benefit by an order of magnitude, and does nothing that would justify a tenth of its price tag. My prediction is that the enthusiasm that brand-new beekeepers have shown for the Flow Hive™ will die down as their bees die out, and die out, and die out. The hands-off, lazy approach to honey-on-tap will not keep colonies alive, and I’ve seen enough beekeepers who are “doing it right” quit the hobby or the business in disillusionment and disappointment as they fail to keep their bees alive, so much so that I’ll confidently predict that those attracted to this gimmick will fall by the wayside in not too long a time. The only question is, what sort of damage will their disease-ridden, collapsing colonies do to others nearby, and bees as a whole, before they put their expensive, newfangled gimmick in the trash and give up the smoker and veil to do something else? This entry was posted in Uncategorized on April 26, 2015 by Patrick. At first glance, I too thought Flow Hive was a genius invention that honors the bees, but after looking under the proverbial lid, I’ve concluded that it takes the bee hive and reduces it into a beer keg. 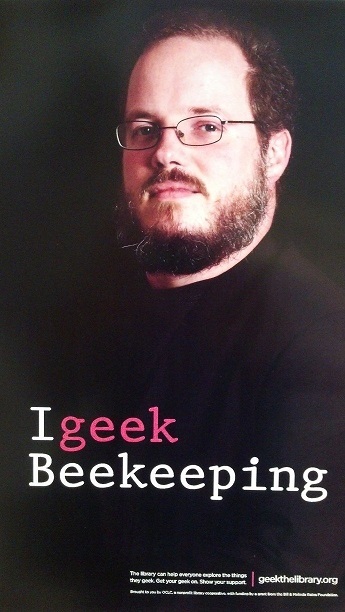 I truly enjoyed your enlightening article with regards to beekeeping, in general. I found it through a FB friend of mine who was one of 3 people who tagged/emailed/tweeted you regarding the Flow Hive. You responded (kindly, I might add) and provided the link to this article. Very informative and easy to read. Well done. Thank you. Thanks, Leanne! I appreciate the kind words.